Tuesday saw the bi-annual fashion fest that is the Brown Thomas pre-season fashion preview. Bloggers, fashion eds and stylists took their seats in the Grafton Street store this week to see the Autumn/Winter 2012 collection. I was asked to guest edit and write a fashion feature for Irish fashion website, WhatSheWears.ie. I really like the site and was delighted to feature as guest editor, joining such fashion leaders as Corina Gaffey from Stellar magazine, blogger and stylist Anne Marie O’Connor and Sarah Rickard from Irish Tatler. Inspirational woman all. Alexander McQueen’s S/S12 collection was breathtaking, looking at coverage of the Paris show, every piece Sarah Burton sent down the catwalk looked like it was sculpted out of coral or alabaster and tipped with gold leaf. Even the oil-slick-black gowns looked delicate and fragile. It is a stunning collection, I love when the art of fashion is so overtly expressed. I am head over heels with the return of the peplum. Jason Wu and Vera Wang’s S/S’12 versions are wearable and easily translatable. While Alexander McQueen and Givenchy’s are exquisite and showy, I like how the peplum has returned in different ways; the traditional version as a second layer over a skirt; on the bottom of jackets to soften sharp, fitted suits; then worn over trousers and shirts as well as skirts. If I could wear it anyway it would be with black netting as part of a pretty floral summer dress by Nina Ricci (pictured). Peplum perfection! I rarely shop on the High Street; I find the idea of buying cheaply made overpriced ‘on-trend’ pieces in manmade fibre, wholly distasteful during such tough economic times. I much prefer to shop at vintage fairs and flea markets. I also shop online through ASOS, its Marketplace; (marketplace.asos.com) is a great way to buy good quality clothes at reasonable prices. 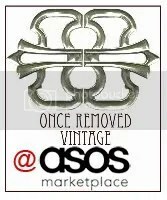 I also sell on there too on Once Removed Vintage. I’m afraid my favourite Dublin shop is no great revelation; Brown Thomas is without a shadow of doubt a heavenly place to be if you like anything to do with fashion. From jewellery, to perfumes, shoes to designer gowns, on every floor you’re surrounded by beautiful things and it actually makes you feel special. The staff are great, the décor is chic and the whole experience is joyful. (Made only that little bit better when you have enough in your purse to actually buy anything!). Eyebrows. I’m obsessed with them at the moment; I recently had an eyebrow lesson from a consultant at Benefit Cosmetics. She showed me how to use their ‘Brow Zings’ shaping kit properly, among other things. When I look back at photographs of myself when I was at university I had really thin brows, (I actually look like I’ve attacked my eyebrows with a disposable razor) I can’t believe the difference that now having a good pair of defining brows makes. Maxi dresses are my staple pieces; they’re as suited for formal events as they are for balmy summer evenings. I have a beautiful black, silk chiffon one with tiny shoestring straps that I wear for anything glamorous, and a number of cheap, brightly coloured ones that are great to throw on with flats for casual summer days. A turquoise and pink bouclé tweed Chanel suit that I found in a dreadful state at a vintage kilo sale (yes, it honestly does happen). It weighed 1.05kg, and at 1kg=€20 it cost me €21. I sent it to the dry cleaners (twice in the case of the skirt), and afterwards removed all remaining marks with wool-carpet cleaner. It’s damn near perfect now. All shoes make me happy, but heels even more so. I like the way they look and I like the way they make you feel. They take a lot more effort to wear than flats, but the rewards from wearing them are worth it. Brand wise I think Kurt Geiger (pictured) manage to achieve the right balance between style, price and quality. They also do great classic pairs that last for years. I have a pair of black suede knee-high boots that I bought four winters ago that I’ve looked after so well they’re still going to be wearable in two winters time. During the daytime I wear Jo Malone, normally it’s the fresh and citrusy ‘English Pear and Freesia’ but I also adore ‘Wild Bluebell’. At night time I wear Coco Chanel. It’s such a heady, sensual scent and is as perfect for evening as a silk ball gown. Even if you don’t think it’s going to suit you, your body shape or your skin tone, try anything and everything. If you don’t try everything, then you’ll never know what definitely does look bad and what looks great on you. Read the full article here, and if you haven’t discovered the joy of reading What She Wears, try it out! Finally Something Inspiring! I’ve felt like I’ve been in style limbo since December. But with the brilliant sunshine in Dublin yesterday came the Spring / Summer 2012 Brown Thomas preview, in its flagship store on Grafton Street, Dublin. Twice a year fashion eds, stylists and bloggers frock up, and bleary-eyed arrive at the invitation-only event to see the new season collection arriving in store. The event is simple and brilliant; It is a fashion show, which this featured models wearing selected pieces from 27 designers. ‘Flower Shower’ (New florals), ‘Sports Couture’, Modernist Monochrome’, ‘Colour’ (The new palette). Monochromes from new designer Jay Ahr (pronounced J.R.), Diane Von Furstenberg and Alexander McQueen L-R: Jay Ahr, Alexander McQueen, Jay Ahr, Jay Ahr, Diane Von Furstenberg, Alexander McQueen. Not that I need an excuse to post about beautifully crafted designer pieces, but Brown Thomas opened up their Christmas Marvel Room last week. It’s basically the perfect Christmas wish-list, which I gather is the whole point. All the exclusive and limited edition Alexander McQueen pieces, and Chanel‘s €5,350 gold and silver python bags were pretty beautiful. Prices weren’t all bonkers though YSL and Mcqueen bracelets are €160 and €120-€150 respectively. Chanel, classic flap sequinned lambskin bags and 1 of only 3 silver python bags, (€5,350). Chanel, 1 of only 2 gold python skin bags. Now it’s all about the Christmas windows! Excited to see how they beat last years!